Secrets of the rejuvenating and life-extension amber-made drink “Lammer Wine”, which was mentioned earlier, had long been a secret. Currently the same drink, which is a tincture of crushed amber, is known as the “The Sun Elixir”. Many believe that the main effect of the “elixir” is that amber acid is its major component. In the former USSR, even the researches of amber acid were carried out as “secret”. As a result, the theme of “solar elixir” for many years was closed and was put under control of special services. 1. Preparation of amber acid tincture. 2. Entering the information of health and youth. 3. Storage and amplification of the entered information. Only pure crushed amber should be used for the tincture preparation. In the past amber crushing process used to be performed manually in a porcelain jar in order to not lose energetic properties of the amber stone. Fine crushing of the amber stone in a coffee grinder or in other grinders results in „discharge“ of amber stone under its contact with metal parts of the grinding device, which leads to reduction of energetic and healing properties of the amber stone. 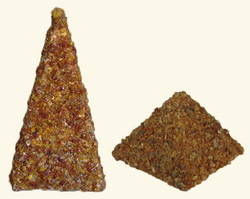 Production technology of the scrub „Cosmetic Crushed Amber“, on the contrary, engages significant amplification of energetic properties of the amber stone. This is achieved in the ultra-fine grinding mill, where the grinding of amber results from the opposing flows and impact of small stones of amber against each other. That is the energy released during grinding of amber is transferred from one particle to another. Finally you decide what type of crushed amber suits your purposes. Our task is simply to give advice which is better. Pour two tablespoons of crushed amber into transparent glass jar with lid. Capacity 0.5 l. Pour the crushed mass of amber with 0.5 liters of vodka or diluted rubbing alcohol. Mix the contents of the jar with table spoon. Close the jar tightly. Choose a photo of your youth. The photo must necessarily be where you are alone. It is desirable that your age on it would not exceed 25 years. The face side of this photo should be attached to the glass of the jar, in which you have prepared a future tincture of crushed amber, with adhesive tape (Scotch tape, adhesive plaster). The level of solution in this jar must be above the edge of the photo. Wrap the side parts of the jar and top segment of the picture with food kitchen foil as well as secure it with sticky tape. Leave the jar with the “elixir” for a month in a dark location away from electronic appliances. Shake the jar daily whenever appropriate. A month later, percolate ready for use “elixir” and pour it into a container of dark glass. As a result of work done in two phases, the information from your photo in relation to your appearance and condition of the organism from a distant youth will be transmitted and recorded to the “memory” of amber tincture. Aluminum foil wrapped around the jar, not only protects the solution from the external effects of electromagnetic fields, but also collects and focuses the information coming from the photo. Cover dark glass storage vessels with the „elixir“ inside and put them into amber pyramid. Dissolved in alcohol amber acid, its salts and other components of the “elixir” are being easily digested by cells and by tissues of the body. It is enough to dissolve in a glass of water one drop per 10 kg body weight. For example, with a body weight of 70 kg 7 drops of the “elixir” must be dissolved in a glass of water. Scheme on usage of the “Elixir” remains unchanged: three days of intake, one day - a break. It is better to intake the elixir once a day, i.e. in the morning 10-15 minutes before breakfast. Miniature amber pyramid made on the basis of “golden-ratio” is a dimensional-temporal resonator, allowing you to for a long time store the information about youth and health in the “elixir”. Remember that even an old dull razor blade, after lying in a pyramid, once again becomes sharp, as the information about the original state of the razor blade lies in the memory of metal the blade is made of. According to E. A Vityuk, regular intake of “the Sun Elixir” slows aging, making it possible to increase the limits of active human life up to 120-130 years. After keeping the crushed amber for a period of 24 hours, percolate the part of the tincture and pour it to the empty jar (volume 60 ml) of crushed amber. This “Express Elixir” should be stored and taken orally, as indicated earlier.